4/17/2018 8:19:00 AM - Education Dept. 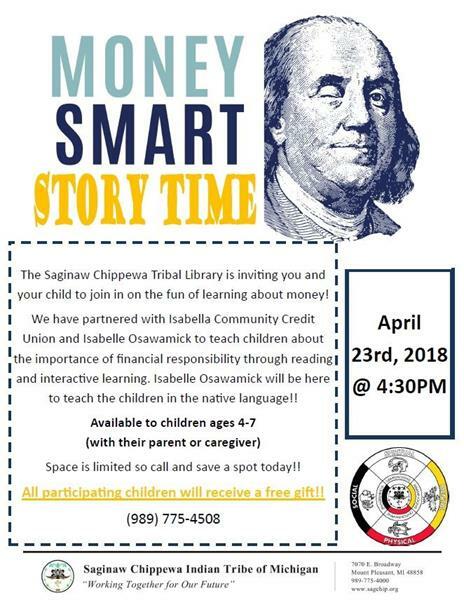 The Saginaw Chippewa Tribal Library is inviting you and your child to join in on the fun of learning about money! We have partnered with Isabella Community Credit Union and Isabelle Osawamick to teach children about the importance of financial responsibility through reading and interactive learning. Isabelle Osawamick will be here to teach the children in the native language!! Space is limited so call and save a spot today!! All participating children will receive a free gift! !